Following two weeks of top class action in London, five nations automatically qualified for the Odisha Hockey Men's World Cup Bhubaneswar 2018. Be the first to get your hands on tickets by pre-registering for all the latest ticket news here. Netherlands, Argentina, England, Malaysia and Canada finished as the top five teams at the first of two Hockey World League Semi-Finals, with five more teams qualifying from the second Semi-Final taking place in Johannesburg, South Africa from 9-23 July 2018. So let's take a look at the qualifiers and their previous World Cup histories. 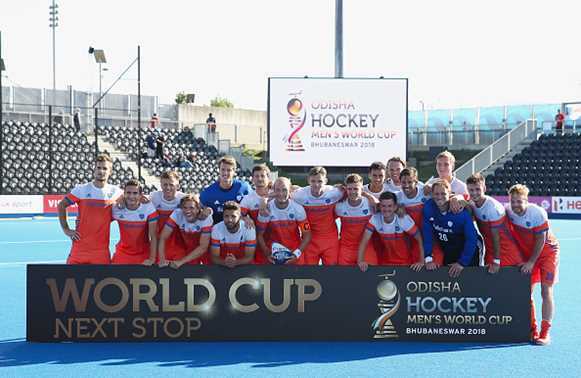 After thrashing the Olympic champions Argentina in the Men's Hero Hockey World League Semi-Final in London, Netherlands will arrive in Bhubaneswar next year confident of a good showing. Oranje are no strangers to World Cup success: they have won the title three times; been runners-up on a further three occasions and have two bronze medals. While they took silver, behind Australia, in 2014 in the Hague, their last win was back in 1998, so Max Caldas and his team will be determined to record a first victory this century. Caldas is a canny coach who led the Netherlands women to a World Cup gold in 2014. He has already seen his team sweep to a magnificent victory in the EuroHockey Finals in 2015 and the manner of their win over Argentina to qualify for the World Cup indicates that Max is finding his Midas touch again. Olympic champions in 2016 and bronze medallists at the 2014 World Cup, it has been a tremendous four years for 'Los Leones' and their charismatic coach Carlos Retegui. But Argentina's success on the international stage has only come about in recent years. Until 2014, Argentina's highest finishing place at a World Cup had been sixth, in 2002. Before and after that, they were usually to be found in the bottom half of the positions. But under world-class coach Retegui – who achieved the unique double of leading the men's and women's team to bronze at the 2014 World Cup – and with players such as Gonzalo Peillat, Lucas Vila and new sensation Maico Casella all hitting their prime, Argentina will be heading to Bhubaneswar with high hopes of bettering their 2014 performance when they took the world by storm with their free-flowing, exciting brand of hockey. A second place finish in 1986 and fourth at the past two editions are England's best performances at a World Cup. But this is a side in transition and Coach Bobby Crutchley is building a team that he believes can challenge for trophies. The first task for Crutchley's team was to qualify, which they achieved by finishing third in front of a home crowd at the Hero Hockey World League Semi-Final in London. This podium finish follows a first success at the Sultan Azlan Shah Cup in Malaysia since 1984. On that occasion it was Great Britain but the majority of those players will now go on to represent England in Bhubaneswar and will take the confidence of these successes with them. Malaysia have made eight appearances in the World Cup, with their best performance to date coming way back in 1975. In the Hague in 2014, they finished in 12th place in their first appearance at the event since 2002. This is a new Malaysia however and, in Razie Rahim and Faizal Saari they have players of world class quality. Throughout the Hero Hockey World League Semi-Final in London, Malaysia grew into the competition: two of the highlights of their performance was their 5-1 win over China and an unexpected 3-2 win against higher-ranked India. For the team ranked 13th in the world, this is a true reflection of the ambitions of the Hockey World League – to allow developing nations to pursue and achieve their ambitions. Canada booked their place at Bhubaneswar with a stunning reversal of form against World Cup hosts India. The Canada team (WR: 11) had lost 3-0 to the reigning Asian champions in the pool stages and were 2-1 down in the 5th/6th play-off. However, the team has a lot of experience among its members and they got back on level terms before nicking the game from the team ranked five places ahead of them in the FIH Hero World Rankings. For many of the Canadian team, the World Cup will be new territory. The 'Red Caribou' last qualified for the event in 2010, where they finished 11th and in their previous four appearances, their highest finish was eighth in 1998. But, in beating India at a major competition for the first time in nearly 20 years [1998 World Cup], the team has made beating higher-ranked opposition to qualify for major tournaments a newly acquired habit – they beat seventh-ranked New Zealand at the equivalent stages of the Hockey World League in 2015.